I really enjoy this time of year in a temperate climate where nature provides a bounty for all to enjoy. 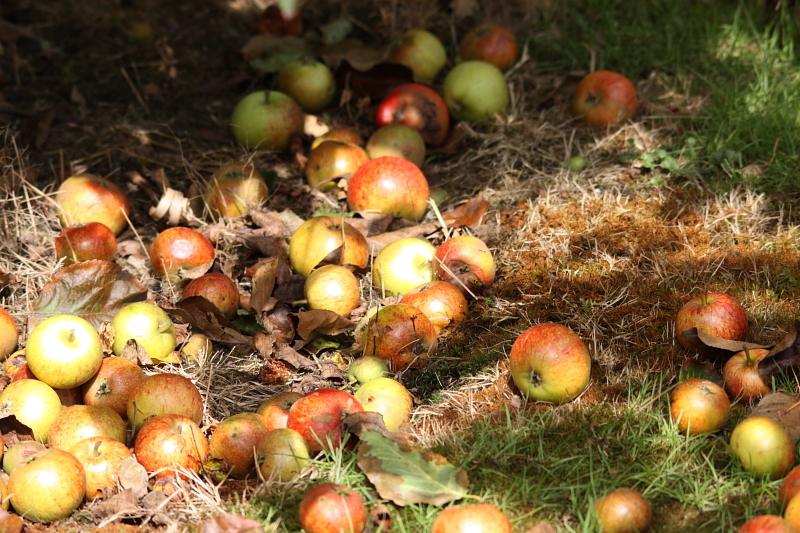 My back garden is full of apples at the moment. Some like the ‘beauty of Bath’ have already dropped their load and the battle is on between myself and the wasps to get the harvest. I think we are getting about 50:50 each at this stage. Next in line is another lovely eating apple ‘Sweet Apple Katie’ which is just starting to drop its bounty now. The weather has turned colder in past few days so I hope to get more of this croip than the beauty of bath. Still green and refusing to fall are the ‘Bramley Apples’, waiting for the first frost before they relinquish their harvest. I have an organic garden, i.e. I don’t spray insecticides or sprinkle slugtox but I do pick the catterpillars off my cabbages and remove the slugs after dark. What amazes me however is that despite the tons of chemicals sprayed in the countryside each year, the birds, butterflies, wasps, bees and hoverflies keep arriving in my garden. The resilience of nature is spectacular. The ability of nature to survive the permanent chemical insults is astounding. How absolutely amazing it must have been in the days before the chemical onslaught.